Sevilla is located in the (one of the many actually) oh-boy-is-that-really-the-temperature region of Spain. It has been historically significative for its financial, artistic and cultural value. But it’s most important role has been that of hosting lots of GNOME activity. The 3rd ever GUADEC was held here, those cool Emergya guys who are working on a11y live here, and the even more awesome Sugus ETSII group —helping with the conference setup and beer availability— who helped organize the GNOME 3 launch party in Sevilla. Not as huge as GUADEC, but certainly as much fun as it, GUADEC Hispana lets the Spanish speaking community get closer together, get bugs fixed and —only as a side effect— get a bit drunk. A big thank to Ana, Juanje, Víctor, the Sugus team and all the local people that contributed. Also, of course, thanks to our GNOME loving (and loved) companies: Emergya, Igalia and OpenShine. And don’t forget Escuela Técnica Superior de Ingeniería Informática who hosted the event. Beer time now. See ya at Berlin. 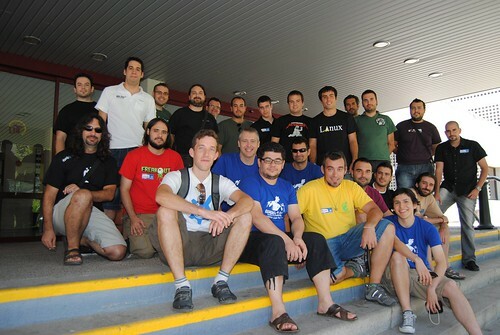 This entry was posted in English, GNOME, planetdebian, planetgnome and tagged guadec. Bookmark the permalink. Applause for this post – one of your best!